Even at the distance of a century, no war seems more terrible than World War I. In the four years between 1914 and 1918, it killed or wounded more than 25 million people–peculiarly horribly, and (in popular opinion, at least) for less apparent purpose than did any other war before or since. 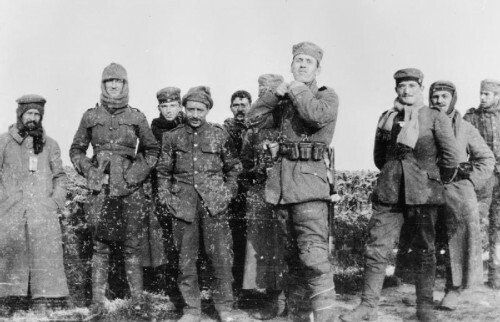 Yet there were still odd moments of joy and hope in the trenches of Flanders and France, and one of the most remarkable came during the first Christmas of the war, a few brief hours during which men from both sides on the Western Front laid down their arms, emerged from their trenches, and shared food, carols, games and comradeship. British troops from London during the Christmas Truce with Saxons of the 104th and 106th Regiments of the Imperial German Army. Men from the Royal Dublin Fusiliers meet their German counterparts in no man’s land somewhere in the deadly Ypres Salient, December 25, 1914. Several factors combined to produce the conditions for this Christmas Truce. 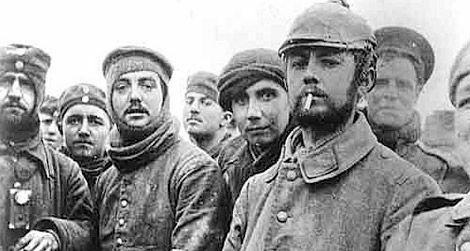 By December 1914, the men in the trenches were veterans, familiar enough with the realities of combat to have lost much of the idealism that they had carried into war in August, and most longed for an end to bloodshed. The war, they had believed, would be over by Christmas, yet there they were in Christmas week still muddied, cold and in battle. Then, on Christmas Eve itself, several weeks of mild but miserably soaking weather gave way to a sudden, hard frost, creating a dusting of ice and snow along the front that made the men on both sides feel that something spiritual was taking place. The war was on again, and there would be no further truce until the general armistice of November 1918. Many, perhaps close to the majority, of the thousands of men who celebrated Christmas 1914 together would not live to see the return of peace. But for those who did survive, the truce was something that would never be forgotten.